Updated April 24, 2015 7am CST: Article update includes title, and first two slides. There was a mistake made on slides and pricing. The analysis below the fold still holds. In a presentation at World Hosting Days AMD released new details about its plans and expectations for its ARM-based server chips. 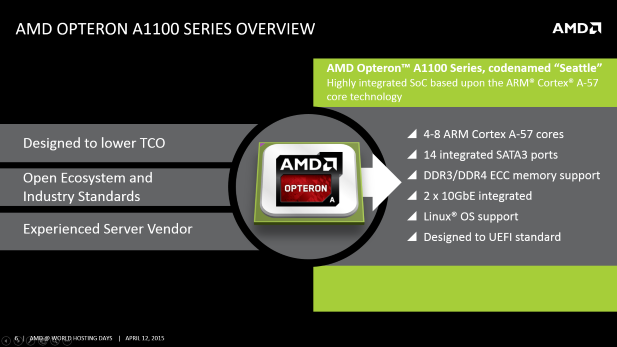 Dubbed the AMD Opteron A1100 Series AMD’s first entry into this market has been consistently promoted by the company over the past two years as the driving force behind their effort to recapture the server market. In AMD’s presentation the company argued that its A1100 series of SoCs are a perfect match for the hosting market because of the need for workload load optimized solutions and the innovation possible thanks to the health of the ARM ecosystem. AMD also reiterated the commitment of its software, hardware, and OEM partners including HP, Cisco, and Microsoft to the creation of a viable ARM server market. 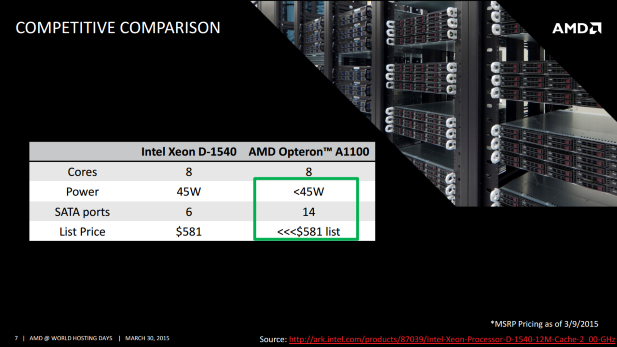 Surely the most interesting item that AMD discussed in this presentation was the market positioning of its A1100 series APUs which are a minimum four months late to market based on the last public roadmap and currently only available upon request as a development kit to the general public. A sub $581 price point is the ceiling for AMD’s per unit pricing structure on its A1100 series chips. Just to emphasize the importance of this point: AMD’s Opteron A1100 Series of SoCs will sell for less than $581 per unit. AMD is going to enter the ARM server market with a pricing strategy designed to undercut the structure that Intel has laid out with its Xeon D series chips.